Heat gas or charcoal grill. In small bowl, mix relish ingredients; cover and refrigerate until serving. In another small bowl, mix mustard and oregano; set aside. Place sausages on grill over medium heat. Cover grill; cook 10 minutes, turning occasionally. Continue grilling 8 to 10 minutes longer, turning and brushing occasionally with mustard mixture, until no longer pink in center. Discard any remaining mustard mixture. 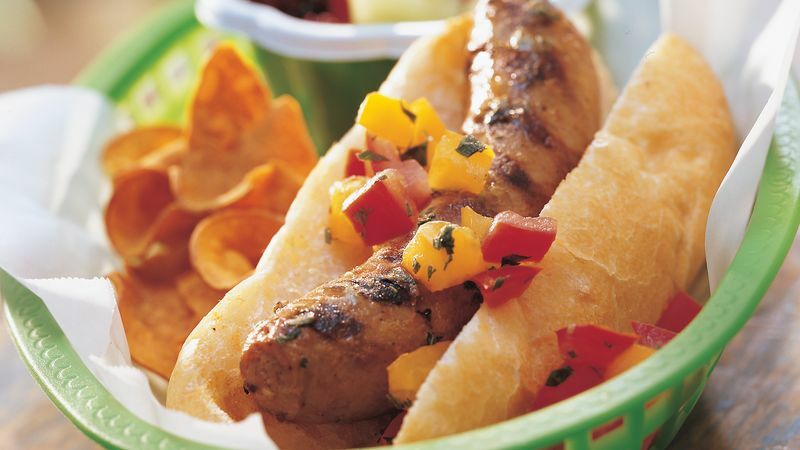 Serve sausages on buns with relish. If yellow pear tomatoes aren't available, substitute your favorite tomatoes or tomatillos. If you like spicy food, try using hot Italian sausages.